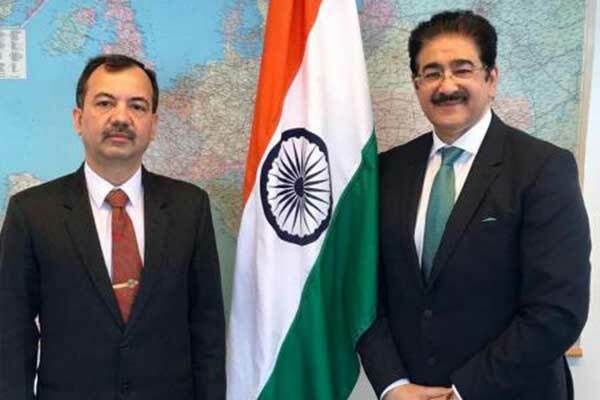 Budapest: Dr. Sandeep Marwah Chancellor of AAFT University of Media And Arts and Chairperson of Indo Hungarian Film And Cultural Forum invited by H.E. Kumar Tuhin Ambassador of India to Hungary at the Embassy of India. It was a long discussion and number of points were discussed to develop and built up better relations between the people of two countries-India and Hungary through art and culture. “We are trying our level best to create a wonderful relation between people of two countries by way of films, television, media, art and culture, tourism, skill development, etc. Recently we have also handed over the scholarship for the deserving student from Hungary to study films in India,” informed Dr. Sandeep Marwah President of Marwah Studios visiting Budapest as Vice President of first mobile film festival of Hungary. “I am happy to receive Dr. Sandeep Marwah who has done commendable work in developing relation between two countries. He deserves pat on his back. We are sure we will go long way in propagating for our art and culture in Hungary through Indo Hungarian Film And Cultural Forum,” said H.E. Kumar Tuhin Ambassador of India to Hungary.